It is not every post you will read which links the choice of web domain name to the results of the civil war, but it is characteristic of this one that that’s exactly what it does. If you are interested in the arcane minutiae of parliamentary structure, this post is for you. But behind the specific points, there is something much more generally significant which should interest everybody, including those who, inexplicably, are not fascinated by parliamentary minutiae. Computers crystallise systems. That’s fine for as long as the crystallised form remains valuable – and sometimes that can be quite a long time. But it’s not at all fine for systems which need to retain flexibility and adapt to changing circumstances – and that’s quite a lot of systems. The lack of a fixed, exhaustive ruleset means Parliament is open to exaptation and adaptation. It is evolutionary by design. It is not brittle. It can sway in winds. Computers on the other hand are really not like this. They tend to prefer defined rulesets. They are deterministic. They are dumb. They are brittle. So the question becomes whether we can get brittle computers to support systems which are not brittle. And that’s a question which matters much more widely than just for parliament. If designers can redistribute power, the choices they make are political – the distribution of power, and the choices it enables, being fundamentally what politics is about. As a designer in government my role is to give power to those people who often feel disempowered. Giving power to the powerless is not a self-evidently neutral ambition. Digital is inescapably political. That’s not to say that that ambition is wrong or is one that designers should not pursue – or even that expressing it in those terms is necessarily politically controversial. But “to redress the balance between the powerful and the disempowered in our society” is inescapably political – and so leaves us with the question of whose choice that is or should be. This interesting post steps back from the detail of digital teams in governments around the world to ask in a more general way where to go next. Once the team has been established, once the early battles won, once the first examples of what better looks like have been produced, once at least some form of stable existence has been achieved – what then? The post is partly a reflection on ways of embedding change in government – by exerting control, or by building consensus – and partly a recognition that some of these teams, including the GDS in the UK, are facing both the easiest and the hardest stage of their existence. Easiest because a degree of maturity has been established, delivery has been demonstrated, and the voices suggesting that the whole thing is a waste of time are quieter and fewer. But hardest because those early deliveries have a tendency to be superficial (which is not at all to say simple or easy): they sit on top of structures and functions of government which remain fundamentally unchanged. That’s been apparent from early on – this post, for example, argued six years ago that the superstructure cannot determine the base. That mattered less in the early days, because there were other things to do, but is critical to the future of government. Behind us is the hard part of starting up. Today is about building capital and capacity. What’s next in the mid term…? A long slow battle over what the structure and shape of government will look like. And making progress on that I fear will be infinitely more difficult and painful than improving services on a project by project basis. Open that isn’t digital doesn’t scale. Digital that isn’t open doesn’t last. There’s more to it than that, of course. But that framing of how to think about the role of government has important implications – most obviously on the weight placed on openness. There is no shortage of pundits describing the need for governments to be digital. Few of them think at all about how being digital (and being in a wider digital context) changes the nature of what government is. If openness is a necessary condition of being digital, digital is only the beginning of what will need to be different. ‘What is good service?’ is a question which is simultaneously very easy but remarkably difficult to answer. It’s easy because, as service users, we all have a strong sense of what is good and bad about our own experience – perhaps including those times when the best service is no service. But it’s very hard because those impressions don’t readily translate into a reliable way of telling whether a service is good, still less so whether a given design approach will result in one which will be good. This post attempts to fill that gap with a set of principles of good service design. It’s presented as a first attempt, with an invitation to make comments and suggestions – but there is nothing sketchy or ill thought out about it and the list very much stands on its own merits. But in the spirit of that invitation, it’s perhaps worth asking a question and making a suggestion. The question is about the intended scope of these principles. Reasonably enough, their starting point will have been the design of government services and more particularly their design in a modern digital context. But that’s not the only domain of service experience or service design. Are these universal principles, as applicable, say, to the service experience of going to a restaurant as to the service experience of getting a passport? Or is there something sufficiently different about them that different principles apply – and if there is, what is that difference, and what effect should it have? 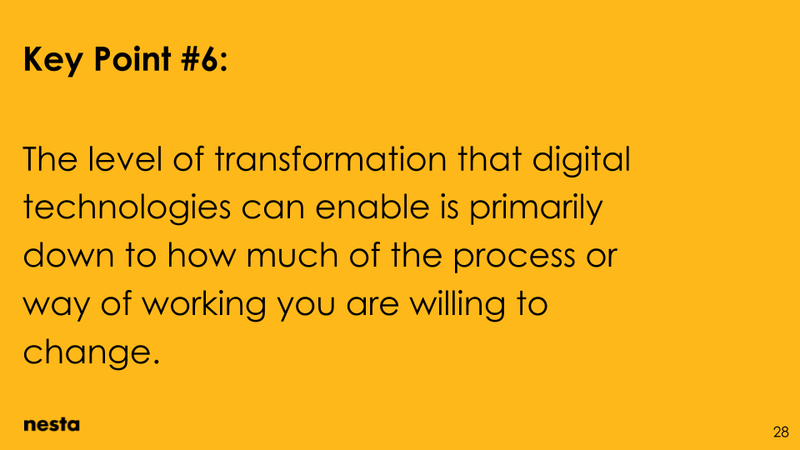 This simple and powerful set of slides does an extraordinarily good job of summarising the key issues in digital transformation, not least in being really clear about the extent to which all of this is a technology issue (not as much as it looks) as opposed to an everything else issue (much more than it first appears). The section on ‘deciding how you want to work’ gets twice as many slides as ‘thinking about your technology needs’, which is a pretty strong indicator of the approach being taken. It’s certainly possible to challenge some of the details. The arresting assertion that ‘we can broadly take for granted that technology can do whatever we want it to do’ perhaps has more power than precision – though the slightly lesser claim the technology needed to support government processes already exists is indeed a useful reminder that appeals for technological exceptionalism are very likely to be misguided. The insistence that agile projects can’t succeed in organisations which retain traditional approaches to funding and governance is both wrong and unhelpful: wrong because there are plenty of example of where it has succeeded, and unhelpful because every organisation has to start somewhere, and if agile can’t work at all unless everything is agile, there is effectively no way of making that start. Overall, though, the strengths far outweigh the weaknesses – and this is a beautiful example of doing the hard work to make things simple. As a further bonus, the slides are open for comments, and have already sprouted a rich set of observations from Matthew Cain. 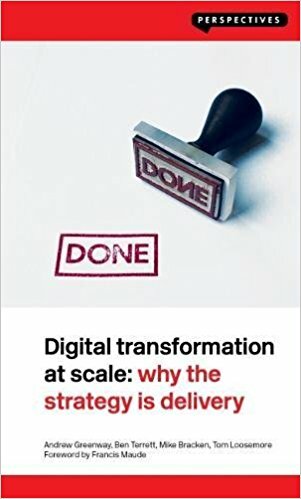 It’s probably not news to most readers that some of the leading creators of the Government Digital Service have written a book. Many have been swift to observe the apparent irony that the book in question has been published only on paper, with no digital version available. That’s a fairly major obstacle fort those of us with a strong preference for the latter. The publisher have helpfully made contact to share the good news that the book is now available on kindle, and apparently is due to appear in other formats. But that leaves unanswered the perennial mystery of why publishers find it so much harder to produce electrons than paper. This is a session pitch for an event which has not yet happened, so it’s a tantalising paragraph rather than a developed argument. But it’s getting a mention because of the power of the thought experiment which lies behind it. Maybe the day will come when the design of public services for Mars will be an immediate and necessary question demanding answers. But we don’t need to wait for that day to ask what it would be like to design public services if we were not constrained by everything which has gone before – which ends up being very similar to Ben Hammersley’s provocation. Down here on old Earth we can’t wish away the installed base, which makes things harder (though we do have a breathable atmosphere, which balances things out a bit), but we don’t have to let our goals be constrained by it. Strategy can easily be seen as a grand and abstract thing, considering people as components of a system if it considers them at all. Strategic change, on that view, involves doing big things, which typically take a long time. That’s not the only way of thinking about strategy, of course. 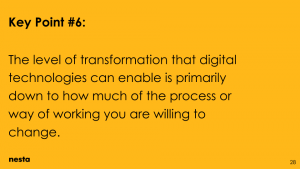 Human-level strategy can result in many small things being done – but which may eventually result in a degree and depth of change greater than any big change can produce (though it may well still take a long time). That reflection is prompted by this post, which is both a very personal story and a description of the modern civil service. Nobody would pretend that the civil service is a paragon of every organisational virtue, but it is striking how far it has changed in composition, attitudes and priorities. That all matters a lot. It matters obviously because it shows an organisation at least striving to respect the diversity of the people who make it up. 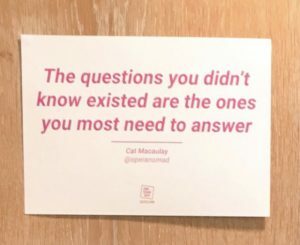 It matters less obviously – but very importantly – because strategic questions understood in the traditional grand way are answered by people who unavoidably bring the experience of their lives to doing so. Diversity is not a soft-edged slogan. It is not even just about respect for individuals. It is a dimension of strategic competence. Dave Briggs is starting a new weekly newsletter. It’s a pretty safe bet that if you like this, you’ll like that.